This blog post describes how I curate and consume my education reading list. It’s a response to Ollie Lovell’s (@ollie_lovell) blog post with the same questions (and title!). We hope that others in the Edu-Twitter/blogging community will also write posts that respond to the same six questions. The greater the diversity of responses, the more likely it’ll be that a reader will find an approach that works for them. Write as little or as much as you like. You might also like to read posts by Michaela Epstein (@mic_epstein) and Jeremy Hughes (@JeremyinSTEM). If you write a blog in response, let Ollie, Michaela or me know and we’ll link to it from our posts. If you were at our #MAVCON session, I presented a few slides which can be accessed here. I start every morning with a cup of tea in bed, and my Twitter feed. I’ll spend maybe 30 minutes scrolling through my Twitter feed, and responding to notifications. Throughout the day, I check Twitter in snatches — when waiting in line, as a short break between other tasks, while walking to meetings (or even in boring meetings :)). A typical evening has some chill time on the couch. If the TV is on, I’m probably idling through Twitter at the same time. By the time I go to bed, I’ve probably caught up on my tweets, ready to start again the following morning. My iPhone tells me that my daily average on Twitter over the last seven days was 2h 48 min. (That’s kind of horrific but, in my defence, I’ve been at a conference all week, and so my Twitter use often skyrockets.) I estimate I’d spend 60-90 minutes on Twitter each day. I follow many blogs. I use an iPhone app called Reeder to aggregate the RSS fields from blogs (more below). Occasionally I’ll check through Reeder and send any long posts I want to read more slowly to Instapaper. If I want to act on it, I’ll email it to myself. If I want to store it for reference, I’ll send it to Evernote. I used to check blogs in a similar manner to how I check Twitter. Now I might spend an hour (at most) every week looking at either Reeder or Instapaper. I joined Twitter in 2009 but didn’t post my first tweet until February 2013. When I began, I followed mainly followed politicians, comedians, productivity and technology experts, and a relatively few mathematicians and maths educators. I read tweets but never responded. 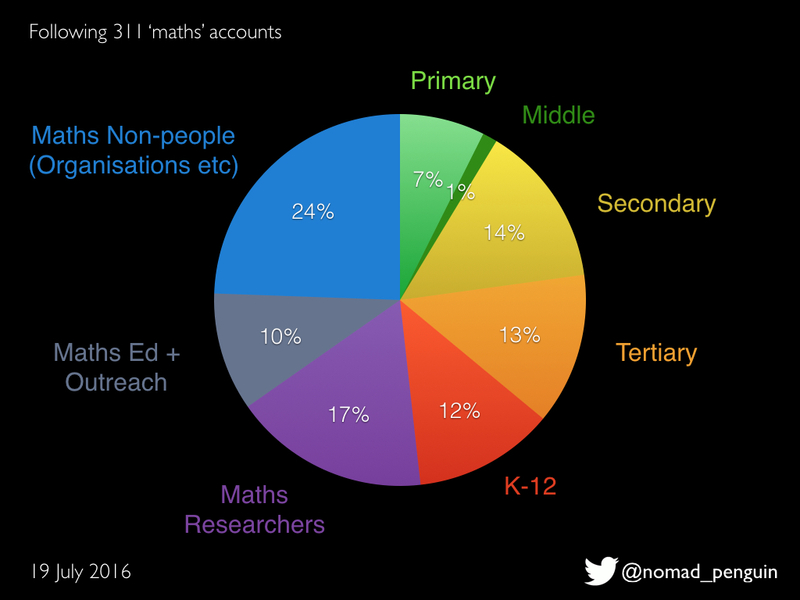 My first maths-related tweet was in 2014 but it wasn’t until I gave one of the plenaries at the 2015 AAMT conference (#AAMT2015) that I started using Twitter to properly engage with other maths educators. I found that the conference hashtags was a good way to follow what was going on, to talk to other people about their reactions to sessions and, after the conference ended, to have a way of keeping loosely in contact with the people I’d met. Eventually I was following more than 1200 accounts. As someone who tries to read every tweet in my timeline (more on that later), I was feeling overwhelmed. I tried lists but they didn’t suit my daily reading style. I pared down the list of accounts I’m following to 600, which is manageable. I’m not sure what proportion is currently maths related. As someone who has a iPhone surgically attached to their hand, that is my primary way of accessing Twitter. The official Twitter website and apps make me want to scream; I use Tweetbot 3 on both my iPhone and MacBook Pro. These third-party apps are missing some Twitter ‘bells and whistles’, but they also suppress ‘features’ I don’t want, like ads and what other people have ‘liked’. Importantly for me, Tweetbot presents my timeline in chronological order, which I find much easier to follow. Occasionally I will use the official Twitter app or website to access group conversations and other features. When I log onto twitter, I start by working through my notifications, then go to my timeline. If there are a lot of tweets, and I don’t have much time, I start to remove tweets from my feed. I do this by temporarily muting hashtags and people that corresponding to tweets I’m less interested in. For example, lots of the people I follow might be at a conference that doesn’t interest me, so I mute the hashtag for the conference. You might be wondering why I ‘waste’ so much time on Twitter. I can honestly say that it has transformed my teaching, and made me feel like I belong in a supportive community of educators. The Math Twitter BlogoSphere directory: find people to follow on twitter or blogs. In July 2016, prompted by Tracy Zager’s keynote at Twitter Math Camp, I did an audit of the 311 maths accounts I followed (out of approximately 700). I like having a breadth of levels, from primary to research level, because those people provoke me to think about different kinds of maths, and ways to teach maths, in different ways. Nowadays, I suspect that I follow more maths accounts, and I hope the range is more even too — I learn a great deal from primary and middle school educators. At the moment I roughly have a ‘one in, one out’ follower policy, so that Twitter doesn’t get too unmanageable. I’ll follow people who have ideas that I find interesting, or who I’ve met in person and with whom I want to maintain some kind of contact. I’ll occasionally go through and ‘evaluate’ the people I follow. Are they still adding to what I’m looking to gain from twitter? How do I react when I read their tweets? If I find myself consistently exasperated (politicians and news sites excluded! ), I’ll unfollow. Life is too short to spend it annoyed by things you can control. If I see something on Twitter that I want to act on, I email it to myself. If I find a good teaching resource/question/idea, I send it straight to Evernote. Later, when I’m scouting for ideas on teaching a particular topic, I’ll have a quick search in Evernote. I’ve already mentioned Evernote and Instapaper. If I know an idea is relevant to a particular project (like a talk I’m giving, or a class I’m teaching), I might save a PDF of the blog post or the tweet in the project folder on my computer. 5. Is there anything you’re still trying to work out in terms of managing overwhelm and the massive amount of edu-info that’s out there? I haven’t mentioned books. I read a handful of edu-related books every year (and many more non-edu books). I haven’t worked out how to take notes that are useful, or to work out a way to reference the good ideas to come back to later. I think I have a lot to learn from Ollie’s post. 6. What are some of your fave tweeters/blogs/podcasts/youtubers etc that you’d recommend to others (please write a sentence or two after each recommendation to say what you like about that source). Without knowing a person’s tastes and interests, I’m reluctant to make recommendations. Instead, I suggest following a few people, paying attention to who they retweet, and then slowly finding more people to follow that way.